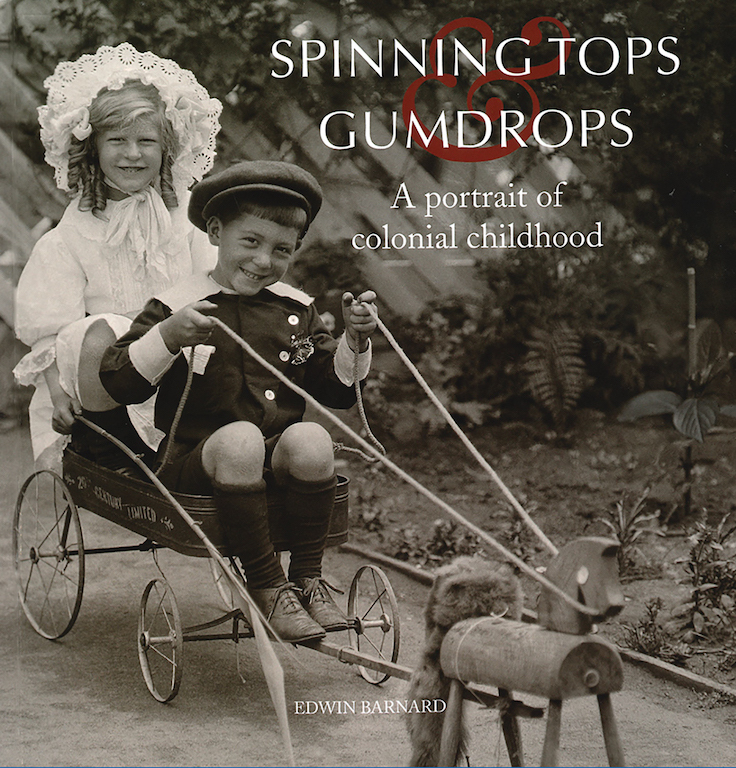 IN this outstanding book Edwin Barnard invites the reader to take a fascinating and insightful journey into the history of colonial childhood. Spinning Tops and Gumdrops spans 1788-1900. It is chock full of stunning photographs and personal accounts of growing up in the colonial era. In some images the children depict a toughness and resilience that was borne out of necessity as their living standards were often harsh, and poverty was not rare. Children from poorer families lacked any form of education; some as young as 10 years old worked in factories for a few shillings to help put food on the table. Young girls found work in clothing factories, wages were between 2/6 and 5 shillings for a 48-hour week. Boys also worked in the factories, some in the gloomy basement ministering shredding machines. How would these children relax after work? Well maybe they would saunter off to the Darlinghurst Gaol to watch a public hanging and if they had time perhaps pelt someone in the stocks or a game of marbles or cricket played in the street among the horse manure and dust before venturing to Braids Dancing Saloon to spy on the girls who were flashy and somewhat notorious. Dear reader, this book is your social history and should have a place on every bookshelf. It demands attention, it has a power that brings to life an era that is so important to the descendants of these children whose fortitude and strength is inherent in all Australians. Spinning Tops and Gumdrops is available from the National Library Bookshop (bookshop.nla.gov.au) and the following online retailers: Dymocks, Angus & Robertson and Booktopia. We have one copy to give away. To enter please fill in the form below, with the book title in the subject line or write to Spinning Tops and Gumdrops, Have a Go News, PO Box 1042, West Leederville WA 6901. Don’t forget to write your name, address and telephone number on the back of your envelope.